Realfish is part of the Musky Innovations Realfish series and is a very versatile bait which can be cranked, twitched, jerked or jigged. Measurements given are as viewed measured American style, hung by the tip of the tail, these baits are 12” long. This bait has proved a great favorite with both Musky fishermen and sport fishermen in the Florida keys where it has taken a great array of sea game fish. Musky Innovations Nanodawg: Here we have two sizes of the infamous Musky Innovations Dawgs which have been miniaturized so that the ultraliters among you can get in on the act. These are dynamite for the smaller species like perch and chub, can also be used for vertical jigging for zander. They all come supplied with weedguards but to make them truly weedless you have to move the belly treble. The 2” weighs 6.5g and come as a pack of 3 same colour and the 2 1/2” weighs 14g and come as a pack of 2 same colour. 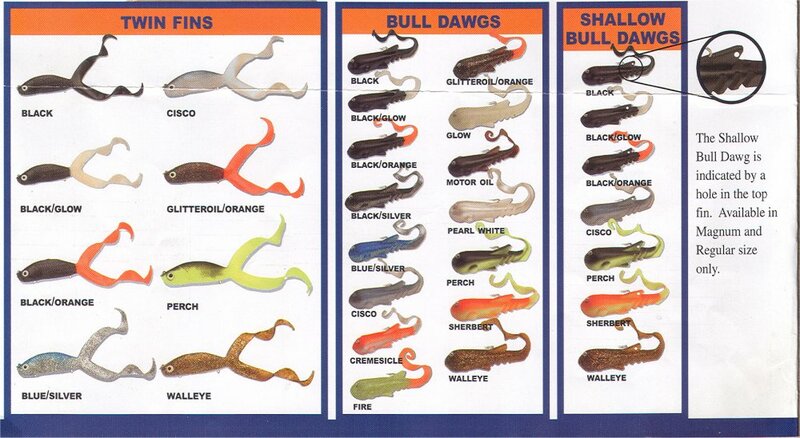 Musky Innovations Bulldawgs: World famous soft jerkbait that really needs no introduction. No serious pike angler is without one or a dozen. Genuine Musky Innovations bulldawgs are all hand poured with hand cut tails which is what gives them their fish catching action. Basically the huge tail wags from side to side and rocks the dawg, This lure was invented by Brad Ruh a couple of decades ago and has spawned hundreds of copies including those further up this page. Brads’ company is called Musky Innovations and is responsible for giving us other fantastic lures such as the deep and shallow invaders, shad clones and many more, all favourites with American musky and pike anglers.